This has always been our family favorite dessert especially after the Chinese New Year. We always make sure that we kept as many of the “nin ko” (in Cantonese) to last us for a long time. 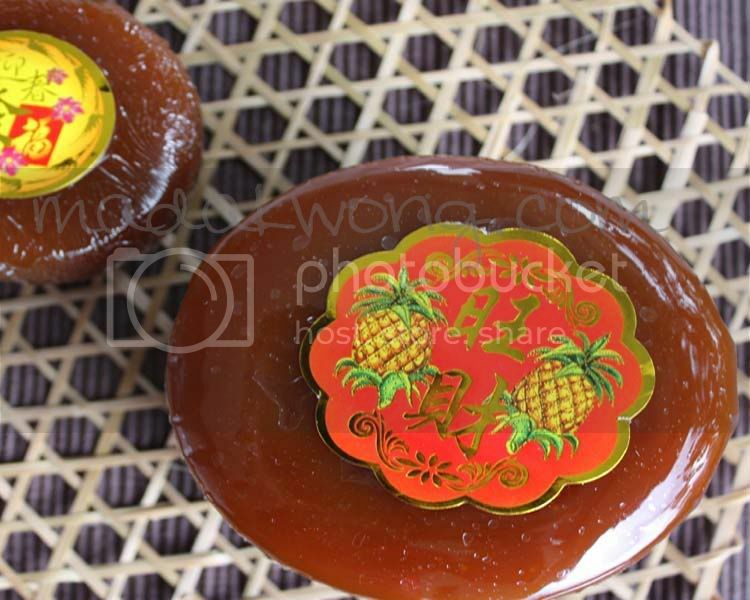 It is also known as Tee Kuih (in Hokkien) or just simply Sweet Cake. To make these fritters, we used tempura flour as batter which made it easier. I’ve also created another simple way to make use of the tee kuih, using spring roll wrapping skin. Having said that, recipe is available after the cut. 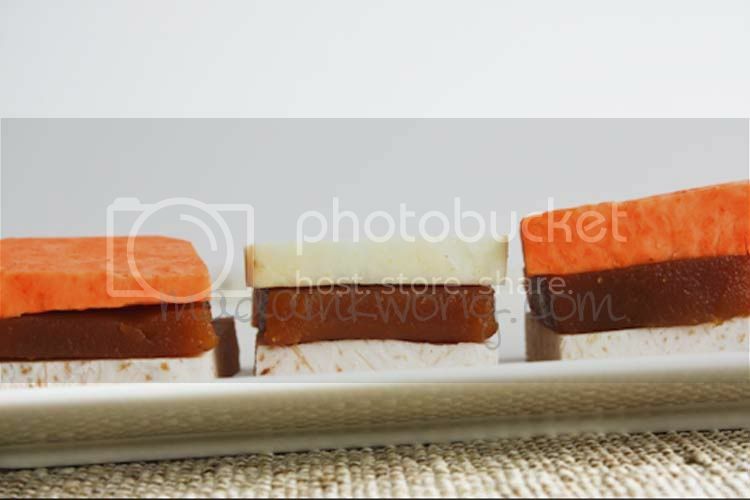 Cut up yam, sweet potato and the Tee Kuih into squares (4cm X 4cm). Mix the tempura flour until it is smooth in consistency. Add a pinch of salt. 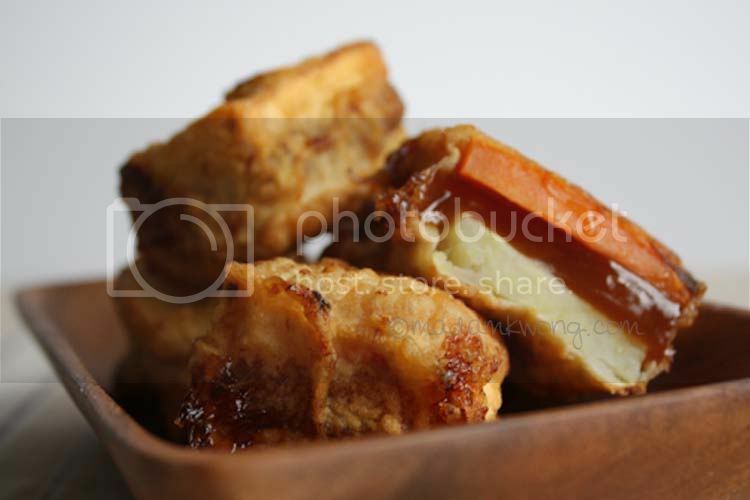 Place the Tee Kuih in between the yam and the sweet potato. Dip it into the batter and make sure it is coated well. Deep fry them in medium heat. For the spring roll method, you’ll need spring roll skin (to make at least 6 pieces). Cut up yam, sweet potatoes into julienne (approximately 6cm). Steam the yam and sweet potatoes for about 15 minutes. Cool the yam and potatoes. In the meantime, cut the Tee Kuih the same length as the yam/sweet potatoes. 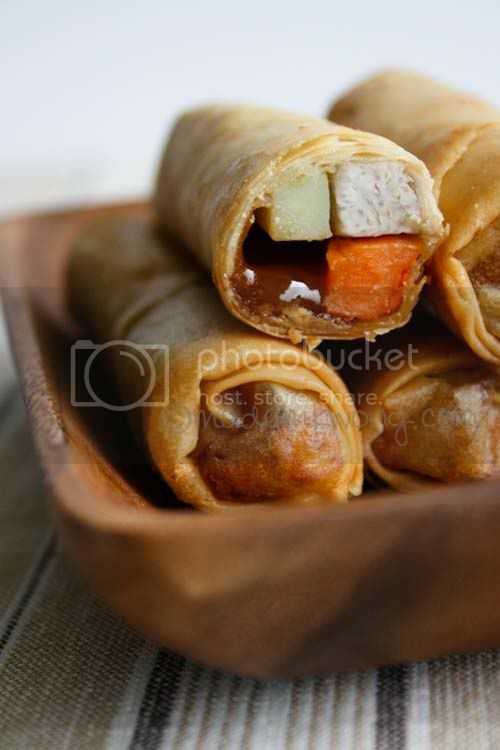 Place all the julienne (pieces of tee kuih, yam and sweet potatoes) on the spring roll skin and roll them (see picture below). Seal the spring roll with some wet flour. Deep fry the rolls until light brown in colour. If Tee Kuih is not available, you can always omit it. I really love tee kuih with sweet potato & yam!! Such classic!